Learning can sometimes be a painful and humbling experience. Just ask me. As I type this my knees are two lumps of hamburger and it hurts to wear pants of any kind. This is the result of some hard lessons learned over the past week in my transition to the butterfly technique. I have been operating under the mistaken impression that dropping down into the butterfly stance meant the pad was "rotating" around your leg as your knees made contact. After reading that many modern goalies strap their pads very loosely, I followed suit and basically had my new pads floating on my legs. 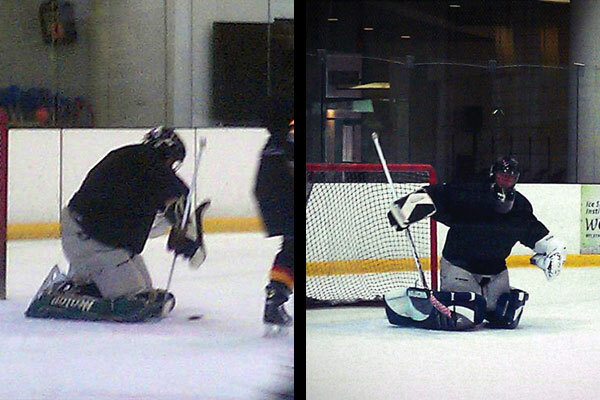 This resulted in my knees completely missing the knee block of the pad and crashing directly onto the ice. 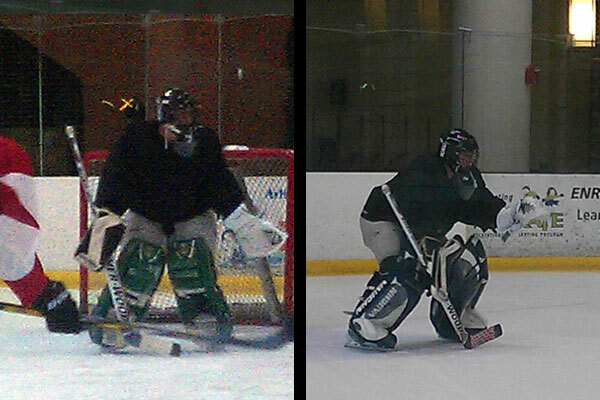 After consulting with guru "Law Goalie" at ModSquadHockey, he corrected me on several issues. Just to be clear, the idea that pads rotate is a confusion. Watch any modern goalie demonstrating butterfly -- and almost any other -- save movements: the pads stay facing the puck at all times. What really happens is that the patella rotates 90 degrees behind the pad: from facing forward, through back of the pad, to facing down at the ice through the knee-block. If your knees are missing the knee-block when you butterfly, it is probable that they are too loose *at the knee*. The biggest mistake many people make in strapping pads is to tighten and loosen every strap proportionately. The next time you're going on the ice, drop into the butterfly in the dressingroom and see if you can 'wiggle' your knee off the knee-block. If you can, tighten those straps (Velcro elastic, leather, whatever) in various combinations until you can no longer 'fall off' the knee-block. 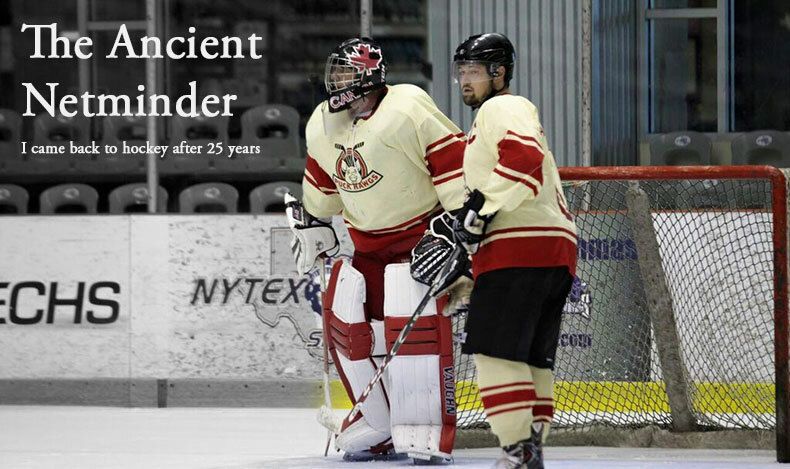 Armed with this knowledge and a new pair of Bauer goalie knee pads, I returned to the ice this past weekend and finally began to see some improvement in my technique. I've also improved my stance by widening my skate position and loosening up my old back muscles and getting into a better (poopypants) crouch. I've still got miles and miles to go towards getting skilled in the butterfly but I can now report my first progress.